Psycho is not a long book. My copy contained just 153 pages and I must admit that, like a lot of people, I have already seen the movie. 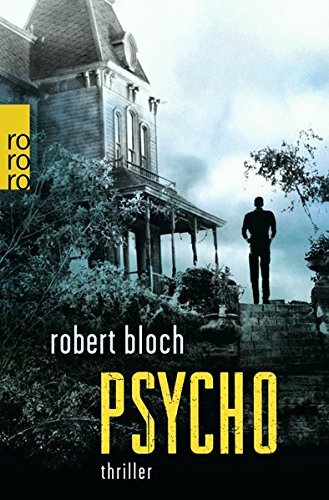 Hitchcock’s Psycho is a great movie, but it does not allow you to get into the heads of the characters in the same way that the book does; so I am very glad that I finally got around to reading Bloch’s classic. I wish that I had read the book before I saw the movie because I would have enjoyed the book all the more if I hadn’t already known the truth about Norman’s mother. But perhaps that would have spoilt my first enjoyment of the film; so it is a case of six of one and half a dozen of the other. Because I have already seen the movie, I already carried a picture of Norman Bates in my head. Not surprisingly it looked a lot like Anthony Perkins. The original Norman, bound in paper and seventeen chapters long, actually looks nothing like Mr Perkins. He is fat, wears rimless spectacles, and turns a lovely shade of red whenever he talks to girls. Norman likes reading. He reads a lot and it doesn’t take many pages before the reader realizes that he is a very intelligent man; although his choice of reading matter can be a little strange. Norman is also a very lonely man whose life seems to have been overshadowed by his domineering mother, with whom he has quite a nasty argument within the first few pages of the book. Norman runs the Bates Motel and lives in the big, old house that stands behind it. The motel does not get much business because the highway has been moved and the new road carries away most of the potential customers. Norman is bitter about this because he had received advanced warning of the new highway and could have sold the motel at the time and made enough profit from the sale to build a new motel in a better location. His mother overruled him though, and he is now trapped in the same house he was born in forty years ago and has a business that is worth nothing. Norman’s only consolation is that he has plenty of time to read. When Mary Crane arrives at the motel she has forty thousand dollars of stolen money in her car. She stole the money from work and intends to use it to start a new life. Mary may be a thief, but she has had a hard life and sacrificed a lot for her mother and her younger sister. Mary was just seventeen-years-old when her father was killed, and she had to forgo college and take care of her ailing mother, while also holding down a fulltime job. Mary was adamant though, that her sister, Lila, would not miss out the same way that she did and so she paid for Lila to go to college. Mary was in her mid-thirties when her mother died and her sister finally finished college and got herself a good job. By that time Mary felt that a lot of her life had passed her by. After their mother’s death Lila insisted that Mary take a holiday; so she did—a cruise—and found a new chance for happiness in the form of Sam Loomis. Sam is a hard working man who owns a hardware store, but he is proud and refuses to marry Mary until he has paid off all of his many debts and can offer her a good life. Waiting has been hard for Mary though; so, when her employer gives her such a lot of money to take to the bank on her way home, she forgets all about the bank and goes home insetead and starts packing. Mary intends to use some of the money to pay off Sam’s debts so they can be married. Unfortunately for Mary she never gets farther than the Bates Motel. She takes a shower, turns around, sees the face of an old woman starring through the shower curtains, and begins to scream. Her screams are silenced by the old woman’s knife; which she later uses to cut off poor Mary’s head. Obviously people come looking for Mary: Sam and Lila, a private detective, and the local sheriff—forty thousand dollars is a lot of money and the rightful owner wants it back. All avenues of investigation lead to the Bates Motel, where the the truth about what happened to Mary is just one of many secrets. All of this attention makes Norman a worried man, but he intends to keep all his secrets—if he can keep his mother under control. Okay, it doesn’t paint a pretty picture, but Bloch manages to paint it without any “red paint”. The reader has to imagine the rest. I was expecting Psycho to be a book that used gallons of red paint. I was wrong. No red paint needed. Psycho is still a masterpiece of horror fiction, that any horror fan will probably enjoy, but can be enjoyed by more squeamish readers as well.